Hotel Prem Bihari is a Budget (Semi Deluxe) Hotel in Haridwar. The hotel is close to Railway station and Bust station of Haridwar. This is one of the best hotel for Budget travelers and Group travellers. Hotel Prem Bihari put all his efforts to provide the best hospitality for their guest with all modern facilities. Hotel Prem Bihari is managed by a team of competent professionals endowed with a wealth of experience. It is their keen understanding and expertise of the hospitality business that has propelled The Hotel Prem Bihari to the forefront of the hotel industry. Hotel Prem Bihari is located opposite to Haridwar Railway Station and Adjacent to Main Bus Stand in Haridwar. Har ki Pauri is 1.5 Kms from the hotel. 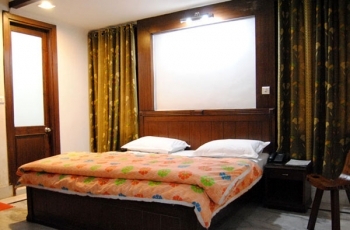 Hotel Prem Bihari has 33 AC Well appointed rooms and suites with a rooftop restaurant. All the room have a perfect blend of luxury. Special facilities are available at the retreat to perform all kinds of Ganga Pujas. There are 10 Double Bed deluxe rooms, 14 Double Bed super Deluxe rooms and 8 Family Suites. Hotel Prem Bihari provides School / College student Group facilities arrangements with group kitchen at very nominal rates. Prem Bihari hotel in Haridwar have a multi cuisine restuarant. - Above rates are subject to change without prior notice. - All room reservations will be held up to 1800 hrs. In case of No Show, No refund will be made. - Preponement and Postponement of any booking will be treated as cancellation and is liable for cancellation charges as mentioned above. - Any delay or cancellation of hotel booking on account of Flights or any other transport arrangement due to bad weather or other natural cause will be liable for cancellation charges as mentioned above. Prem Bihari Budget Hotel is 200 Kms from Delhi, 35 Kms from Jolly Grant Airport Dehradun.